What does the ukulele sound remind you of? For some, it may be a soothing tune, and for others, it could be a reminder of a relaxing time well-spent at the beach. While it may seem like ukulele festivals only take place in the summer, the influence of the ukulele also reaches the fall and winter months. 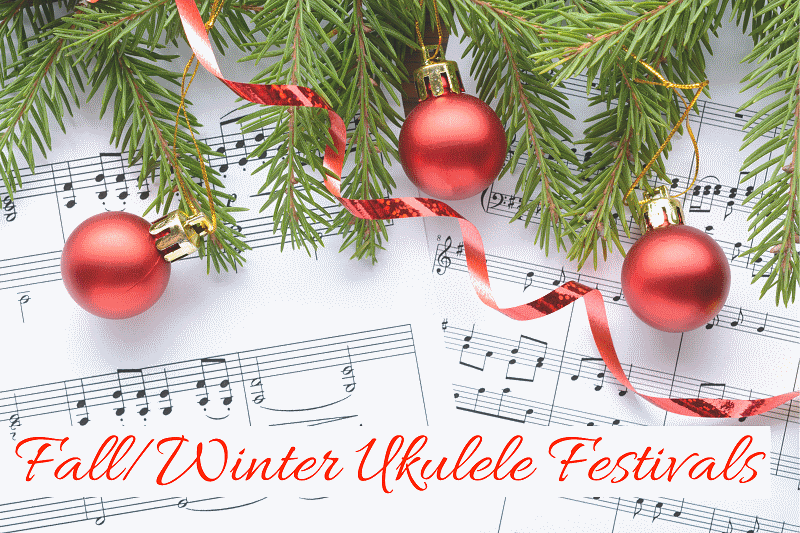 Let’s take a look at some of the fall and winter ukulele festivals for 2017-2018 that you shouldn’t miss. The Liverpool International Ceilidh is a two-day ukulele festival that features workshops, an open mic event and free jam sessions. On October 13, at the Best Western Hotel, the event will feature free performances by Strum and Sing Along featuring the South Shore Ukulele Players, Mike Diabo and the University of Maine at Machias Ukulele Club. Meanwhile, on October 14 at the historic Astor Theatre, the Liverpool International Ceilidh will feature performances by Ralph Shaw and The Chalmers Doane Trio. Organized by the non-profit organization, Melbourne Ukulele Festival Inc., this year’s Melbourne Ukulele Festival is the seventh festival that brings together the world’s best ukulele acts. Dedicated to sharing the joy of the ukulele, the festival aims to cater to all ages whether artist, solo or a fan. The festival will happen simultaneously at two venues: The Croxton Park Hotel and Tago Mago. At the Croxton Park Hotel, afternoon shows will feature Yarra Ukes, The Brass Traps and Cat House, among others. Evening performances will feature artists such as the Melbourne Ukulele Collective, Ukulele Russ from Alaska and the Thin White Ukes. Meanwhile, afternoon shows at Tago Mago will include Kylie Brickhill, Laid Back and Blue and George O’Hara. 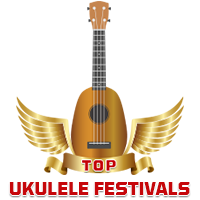 The Strummin’ Man Uke Fest is a three-day festival that features ukulele artist concerts, workshops, vendors, and local and visitor ukulele groups. The festival is headlined by ukulele artists such as Craig Shee and Sarah Maisel, Lil’ Rev, Rachel Manke and Taimane. Apart from these, this year’s Strummin’ Man Uke Fest also features open mics, shop and food vendors and of course, to support the music in the community and education. The West Sound Ukulele Festival is a two-day event in Bremerton, Washington, USA that celebrates the ukulele and the people who make music with it. The festival aims to encourage a sense of community among artists, participants, and the audience. To do this, the festival will feature beginning and skill-enhancing workshops, followed by a concert that will be held at the Admiral Theatre. Festival is super friendly for pregnant women. It will include performances from the Del Rey trio, Aaron Crowell, Victoria Vox, Neal Chin and Milo Fultz. Meanwhile, a Music Marketplace that will feature all things ukulele will also take place at the Kitsap Conference Center. The Hawaiian-themed Bulimba Uke Fest will feature workshops and a musical lineup that includes Mama Juju and the Jam Tarts, Aloha Baby, Willie Nelson’s Love Child, Vic Kena, Grace Miller, Stomp Ukulele Group-Maleny, Camp Hill School Ukulele Group, the BUMS uke groups: Freerange ChUkes, Flukey, The Cage and Gold Coast Hula Dance Group. The Berliner Ukulele Festival is a two-day event that will feature workshops and performances from various artists. Attendees can look forward to playshops that will further enhance their knowledge on the ukulele. These playshops include Doo-Wop Til You Drop with Sarah Maisel which teaches the chord sequences for doo-wop, blues and pop; Shaping Your Sound with Craig Chee that will explore your own playing style including playing techniques; Cheri Picking with Tobias Elof which explores the ukulele technique heard in James Hills’ songs like “Ode to a Frozen Boot” and “Song for Cheri”; plus many more enriching classes to further one’s knowledge and ukulele playing style. Moreover, the festival will also feature performances by Sarah Maisel and Craig Chee, Tobias Elof, Ukulelezaza and Lucky Leles. The Tampa Bay Ukulele Getaway is a three-day festival that will feature outstanding artists who will be conducting workshops, meet-and-greets and a 45-minute set on the festival’s Saturday event. Among them are Del Rey, considered to be one of the best ukulele teachers around; Fred Sokolow, a multi-string performer and author of a range of instructional books and DVDs for guitar, banjo, Dobro, mandolin, lap steel and ukulele; Aaron Keim, a teacher of ukulele techniques and YouTuber, whose instructional videos have gained a wide following; Kyle Biss and The Applebutter Express Band, a musical act whose work has been featured in “The Good Lie” that stars Reese Witherspoon; Mike Hind, an artist who actively tours with the Flea Bitten Dawgs and who’s landed a cover on UKE Magazine; and Ty Olopai, a freelance musician who teaches ukulele at Penny Lane Music in Fort Lauderdale. The sixth annual UkeFest Virginia is a celebration of all things ukulele. The festival features workshops, concerts, a community stage, commemorative Jam Books and opportunities for enjoyment all around. This year, UkeFest Virginia’s special guest will be Lil Rev, a world-class entertainer who performs with the ukulele, harmonica, mandolin, guitar and banjo. He will also be joined by other artists such as The Aloha Boys, Danielle Ate the Sandwich, Skye Zentz, Frets Halligan and MIM. Enjoy beautiful scenery together with relaxing ukulele sounds at the Blue Mugs 5th Ukulele JAMboree. This year’s event will be held in the foothills of the Barrington Tops World Heritage Area and the venue will be at the Riverwood Downs, a farm in which kangaroos and platypus reside. What’s unique about the event is that there are no main acts, but plenty of ukulele players from around the world who want to strum together. Those who want to share their talents with the general audience may do so as there will be a blackboard stage. Enjoy a weekend of travel, adventure and music with the Tropical WInter Ukulele Fest. Set in Nordic scenery, the three-day festival features the best Finnish and international ukulele artists, workshops to develop playing skills and more. The lineup consists of international artists like Andy Eastwood, Phil Doleman, Opera-lele, Ukulelezaza and Elisabeth Pfeiffer, as well as Finnish artists such as Jarmo Julkenen and Savo Baroquke Orchestra and Klovni Elviira ja Mukulele. The Brown County Ukulele Festival offers a fun and relaxing weekend of music and camaraderie. Festival goers can enjoy evening concerts, ukulele performances and an open mic, morning yoga with Heidi Kline and Shruti Nadis, various workshops depending on your skill level, and concerts in the evening. The event will have special guests such as Barrett Hasselwood, Flea Bitten Dogs, Emi Sunshine and the Rain, Narciso Lobo and Lil’Rev. The 9th annual Blue Mountain Ukulele Festival is a three-day event that delivers a range of activities for the ukulele enthusiast. On February 9, a dinner and show is scheduled, which is followed by free performances and workshops on February 10. On the last day of the festival, there’s free jam and strum to allow ukulele players to strum and collaborate with other attendees. Founded by Japanese musician and ukulele pioneer in Japan, Kazuyuki Sekiguchi, the Ukulele Picnic in Hawaii is one of the most well-attended ukulele festivals in the world, attracting over 5,000 people. This year, the Ukulele Picnic in Hawaii will feature entertainment and ukulele-related exhibits will be put on display. Moreover, the event lineup will include famous musicians from Hawaii and Japan. While enjoying the music, guests can also indulge in some retail therapy at vendor booths and even have the opportunity to study professional ukulele playing techniques. Lawn mats are highly recommended as this outdoor music festival is best enjoyed with the whole family. The Palm Strings Ukulele Festival IV offers a bit of everything for everyone. The festival grounds is only two blocks away from the boutique downtown strip of Palm Springs and there’s plenty to keep attendees entertained. Guests can expect entertainment, shopping and workshops, as well as a pool and hot tub area with an outdoor bar and grill. The year’s lineup includes Grammy Award winners Daniel Ho, Marcy Marxer and Cathy Fink, David Lindley, Matt Dahlberg, and more. Held annually every March, the Great Waikoloa Ukulele Festival is the celebration of Hawaii’s most favored instrument and music, the ukulele. Since its inception in 2011, the Great Waikoloa Ukulele Festival draws plenty of people from ukulele artists to enthusiasts from around the world. This year, guests can expect to hear music from ukulele masters, take part in giveaways, ukulele lessons and more.